Norfork Lake springtime fishing is at its best. This is one of my favorite times to fish the lake. 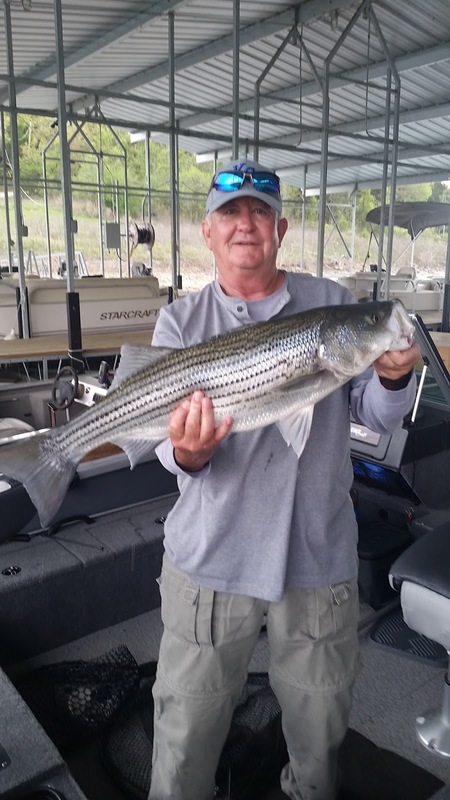 All species of fish are in shallow water and we get a lot of good topwater action for striped, hybrid, and white bass, as well as, largemouth and smallmouth bass. Artificial baits and live bait work equally well this time of year. Shad are spawning, as is typical for this time of year. The shad spawn really gets the fish excited! Striped bass, hybrid bass and white bass fishing was on fire the last week. 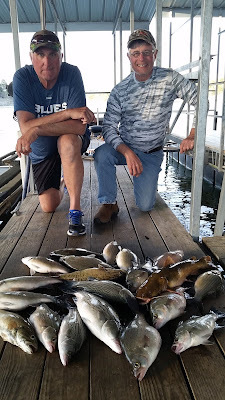 Once our lake temperature reached the mid 60's the fish became active. Today was a great example of spring topwater action. Several of my friends were out on the lake and we were all checking out different areas. One found the fish blowing up back in a cove at about 7AM. He gave me a call and we all had great fun for the next 3 hours. 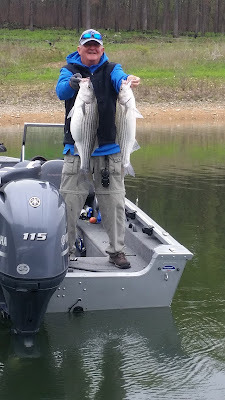 I was throwing a 5 inch pearl swim bait with a 3/8 ounce jig head, and a Zara Spook Jr. It is a blast to watch these fish blow up on topwater baits. Best places to look for topwater action is part way back into the creeks and in the secondary coves in the creeks. 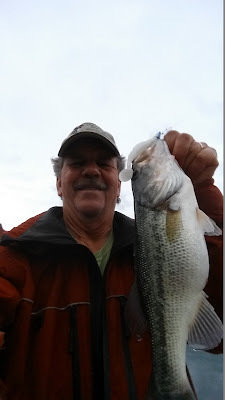 Right now I have heard of topwater action in all parts of the lake so get out there and have some fun. 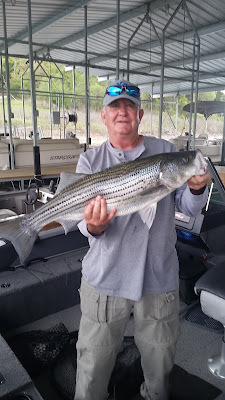 The late afternoon bite has been great one day, then very hard to find the fish the next, but when you do find them they very well could be busting the surface. Largemouth, smallmouth and spotted bass fishing is also excellent at this time. 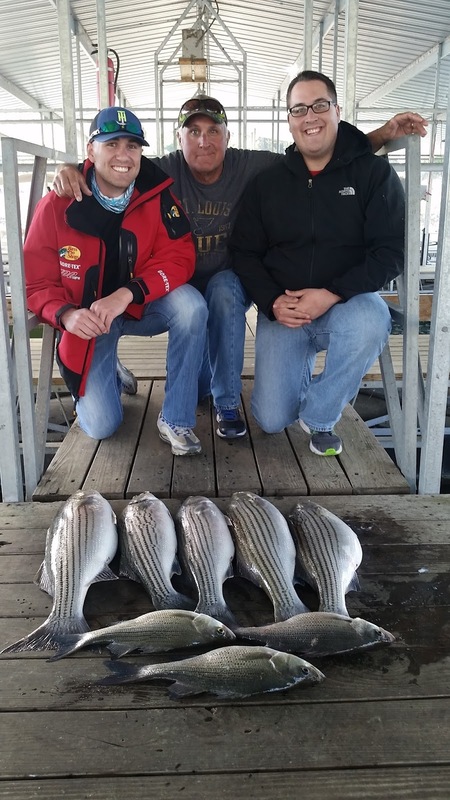 Look in the same areas that the stripers are in, but mainly look at the shoreline. You will find the water boiling with shad right up on the rocks. The fish are pushing the shad in tight to the shore then feeding at will. Today they were in the same cove that we found stripers in from 6 inches of water out to 6 feet. Both my Zara spook and my swim bait were picking up some very nice fish. The fish also wanted both of my baits worked very fast as they were in the chasing mood. 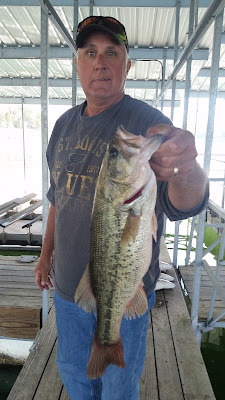 As the day wears on the largemouth will move out into a little deeper water so a jig and pig or some other plastic bait worked along the bottom will pick up some good sized bass. At sunset look at the very shallow water again as they will start to feed heavily on shad. The after dark bite for large and smallmouth bass should be good. I haven't been out myself but typically they will be hanging around docks and shallow points. Dark colored spinner baits and tube jigs are some of my favorites. 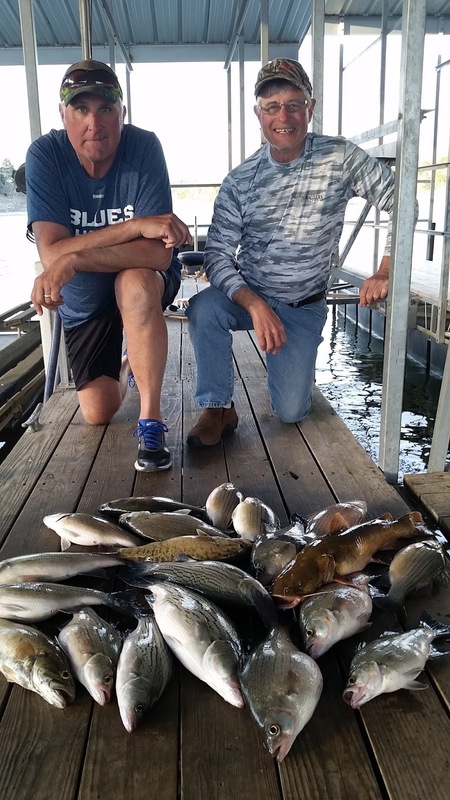 Walleye, I bet you can guess, are in the same areas as the stripers and the largemouth. My swim bait is picking up some nice fish early in the morning and then again at sunset. The walleye are also starting to show up on the big shallow flats in 10 - 25 feet of water. Move slowly with your trolling motor with a bottom bouncer and crawler harness or a large shiner on a drop shot rig. 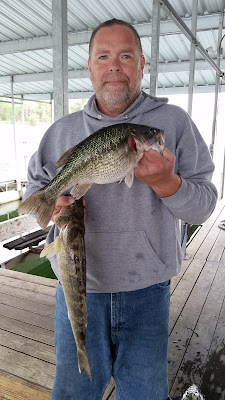 Crappie are showing back up on brush in 20 - 30 feet of water. Most times you will find them suspended over the brush so you need to keep testing different depths until you find the feeding fish. There will be a few nice fish still on the bank so casting a small Roadrunner will work and will also pick up other species. 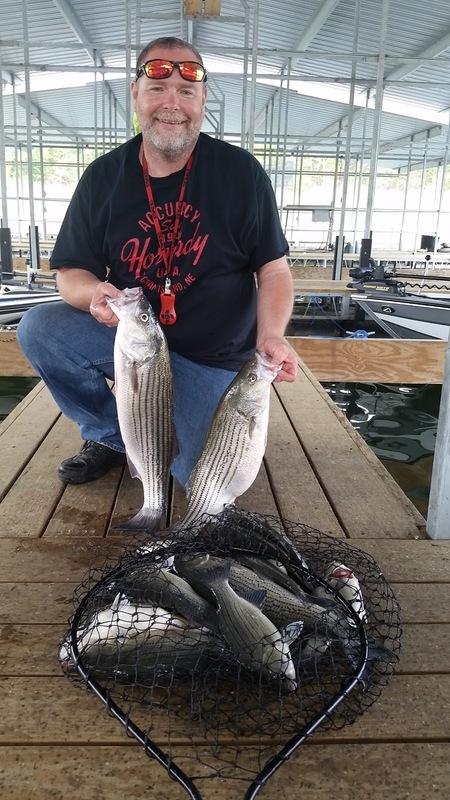 Hang on with your crappie rod because it is not uncommon the hook into a big striper while crappie fishing this time of year. clearing and the creeks and coves are a little stained, but are clearing rapidly.